If the American Federal Communications Commission (FCC) tells you not to do something — like launching satellites without their approval, for instance — it's probably in your best interest not to do that thing. And if you ended up doing it anyway, as US-based startup Swarm Technologies did, you'll likely be hung up to dry and fined an inordinate amount of money — $900,000 in the case of Swarm Technologies, Quartz reported. The American startup was fined for having launched four unauthorised satellites on an Indian Space Research Organisation 31-satellite rideshare mission in January 2018. Along with ISRO's 100th satellite to be launched into orbit, the mission also held room for 30 commercial satellites, coordinated by ISRO's commercial arm, Antrix Corporation. 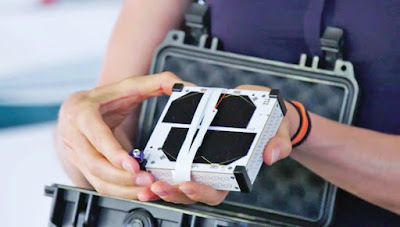 Swarm's four 'SpaceBEE' satellites were deployed on ISRO's PSLV rocket despite having its application for launch denied by the FCC a month earlier. The regulators expressed that the satellites were far too small to be detected in space by terrestrial detectors, threatening the many other satellites in orbit with a higher risk of colliding into them. An investigation into Swarm Technologies began in March earlier this year, in which the FCC dug up more surprises. The FCC discovered quite a few "unauthorised weather balloon-to-ground station tests and unauthorised tests of its satellite and ground station equipment" following the launch of Swarm's SpaceBEEs. Over the course of FCC's investigation, the agency gave Swarm approval to start communicating with their satellites in August this year. It also allowed a second, approved launch of the ultra-small satellites in November — this time, on a SpaceX rocket. This, because despite the FCC’s initial concerns, it was possible for Swarm's SpaceBEEs to be detected consistently by commercial radar stations since their (unlawful) January launch, which was the crux of FCC's concerns about the satellites, to begin with. Interestingly, Swarm received grants (including one from the American government's National Space Foundation (NSF)) for their technology. According to the grant, the satellites commissioned by the NSF were intended to support “the world’s smallest two-way communications satellites and associated ground hardware,” with applications focussed in “Internet of Things” devices. Given the NSF's investment in the “unique launch economics afforded by the miniaturised satellites,” as the grant award calls it, funding from the American government appears to have played a part in the unauthorised satellites' launch. Swarm appears to be at the tail end of its controversy and gotten away with having four illegally-launched satellites orbiting Earth for all intents and purposes for the time being. But, another takeaway from the episode was the lack of communication between two closely-related arms of the US government, the FCC and the NSF. With space startups burgeoning in the US, particularly in Silicon Valley, the case has thrown a spotlight on the approaches taken by the US government to regulate space. Both US lawmakers and the Trump administration have announced that they are working to address this gap.